We organize special training & entertainment programs specially for corporate peoples. Who really work hard in their daily life. From lectures and case studies to role-plays and simulation exercises, corporate training and development programs have come a long way. Organizations all over the world are changing at a fast pace. File cabinets and photocopiers are being replaced by paperless transactions. Organizations are moving towards flatter structures, flexi-timings, and 360� appraisals. Large monolithic organizations are experiencing a process of decentralization and empowerment of individual business units. It is no surprise that training methodologies are being continuously refined to meet the demands of changing times. Training methodologies vary with every organization, its values, objectives and goals. Methodologies that are more participative and learner-centered in their approach are being preferred over traditional classroom training programs. New methods of experiential learning are being used more frequently. Outdoor training and development, based on this philosophy of experiential learning, is a refreshingly different and potent method of achieving training and development goals. 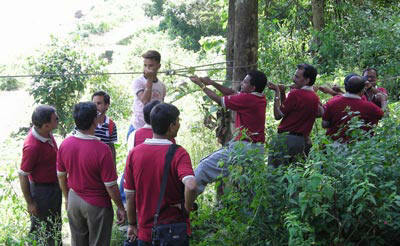 We conducts developmental programs in the outdoors. Outdoor activities and adventure have immense potential as training tools and act as a trigger to working towards organizational or personal objectives. These programs, based on the concept of experiential learning, are conducted for managers, professionals and youth groups. Our programs are exciting, challenging, effective and a lot of fun! We believe in Outdoor Training Modules for a simple reason that people enjoy it and when you add learning to it then it stays forever. The impact of such training is immediate in an organization. Our programs and outdoor training patterns are designed to give a lift to the caliber that already exists in an individual; we make them more aware of it and how they can use them in a team. Our training format is flexible and tailor-made to suit your needs. 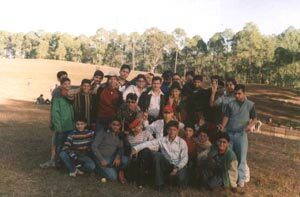 Interactive and experiential team building games organized in and around the camp focus on the key areas of personal development or just plain fun. We organize incentive holidays for different corporate sectors & institutions. We manage all services & facilities for that kind of packages. Right from transport up to activities & fun. Specially in that kind of packages our hospitalities are best. Outdoor sessions not only help in building team spirit but also bring a welcome change in the daily monotonous routine of city executives and rejuvenate them to face the organizational pressures.